ISIS blew up Shi'ite mosques in Mosul in 2014. The recent bulldozing by the Islamic State (ISIS) of the ancient cities of Nimrud, Hatra, and Korsabad, three of the world's greatest archaeological and cultural sites, is just this group latest round of assaults across the large area under its control. Since January 2014, the flamboyantly barbaric ISIS has blown up Shi'i mosques, bulldozed churches, pulverized shrines, and plundered museums. Worse, the ISIS record fits into an old and common pattern of destruction of historical artifacts by Muslims. Some attacks target the works of other, rival religions, such as Orthodox churches in northern Cyprus (since 1974), the Bamiyan Buddhas in Afghanistan (in 2001), the Ghriba synagogue in Tunisia (2002), an historic Hindu temple in Malaysia (2006), and the Assyrian antiquities ("idols") in Mosul (2015). On a personal level, a Saudi national smashed historic statues at the Senso-Ji Buddhist temple in Tokyo in 2014. Nor is this danger over: Islamic leaders have bruited plans to destroy Persepolis in Iran, St. Catherine's Monastery in the Sinai, and the Great Pyramids of Egypt. All other major religions have moved beyond such crudely violent impulses. In some cases, conquerors turn non-Islamic holy places into Islamic ones, thereby asserting the supremacy of Islam. This can be done by converting them into Islamic sanctities, such as the Kaaba in Mecca, the Cathedral of St. John in Damascus, and the Hagia Sophia in Constantinople; or building on top of them, such as Al-Aqsa Mosque in Jerusalem and Babri Masjid in Ayodhya, India. Muslims of one denomination sometimes destroy the legacy of other Islamic sects. Recent examples include the tomb of Sidi Mahmoudou, a medieval structure in Timbuktu (2012), Sufi tombs in Libya (2012), and the libraries of Mosul (2015). 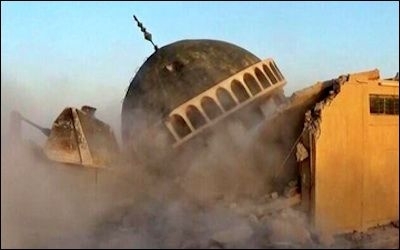 But best known is the Saudi destruction of antiquities in Mecca since the 1990s, applying strict Wahhabi principles of non-intercession; even Muhammad's tomb in Medina is in jeopardy. 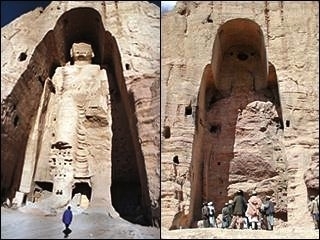 The Taliban blew up a monumental sixth-century Buddha statue in 2001. Destruction also accompanies the fighting of war; the Syrian conflict since 2011 has been particularly devastating in this regard, with battles causing severe damage to such grand antiquities as the Citadel of Aleppo, the Umayyad Mosque, and Crac des Chevaliers. Alongside, smuggling and other profit-making activities to pay for war costs leads to the wholesale stealing and trafficking of rare antiquities; UNESCO reports, for example, that the ancient Syrian site of Apamea is "completely destroyed." Ancient artifacts might even be demolished because their space is needed for something deemed urgent. The Palestinian Authority threw out precious Temple Mount archeological remains as mere rubble in 2000 to build a mosque. In 2013, Hamas bulldozed part of the 3,000-year-old Anthedon Harbor in Gaza for military purposes and the Turkish authorities damaged the Byzantine-era walls of the Yedikule Gardens to build a decorative pool. Finally, there are gratuitously self-inflicted cultural wounds. These include the pillaging of Iraqi museums, libraries, and archives (2003), the burning in 2011 of L'Institut d'Égypte and looting of the Egyptian Museum, the 2013 destruction of manuscripts in Timbuktu and the ransacking of the Mallawi Museum in Minya, Egypt, and the 2014 destruction at the Saeh Library in Tripoli, Lebanon and at the Museum of Islamic Art in Cairo. 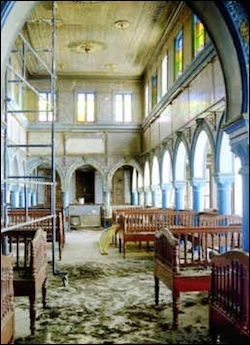 Al-Qaeda bombed the Ghriba Synagogue in Tunisia in 2002. Why does Islam inspire its adherents to annihilate their own patrimony? Because humiliation establishes and reinforces one's superiority. Destruction of infidel remains confirms the superior power of Muslims and, by implication, the truth of Islam. In parallel, eliminating the vestiges of Muslim rivals establishes the superiority of Islamism over other, less assertive interpretations of Islam. While the seizure and appropriation of other monuments began at the very inception of Islam (i.e., the Kaaba), the destruction that has reached orgiastic heights with ISIS is something new; note that nearly all the examples listed here date from the twenty-first century. Turned around, those recently-destroyed antiquities survived so long because Muslims had left them alone. In this regard, things are far worse these days than ever before – not a surprise, as Islam is in its worst shape ever. All other major religions have moved beyond such crudely violent impulses whose motive is unacceptable and whose results are tragic. Is there a Middle Eastern country that exults in its multi-religious heritage, celebrates ancient artifacts on coins and stamps, builds fabulous museums for its antiquities, treats archeology as a national pastime, and studies manuscripts rather than burns them? Well, yes, there is. It's called Israel. The rest of the region could learn a thing or two about historical appreciation from the Jewish state.